BRISBANE, Queensland, Australia, October 19, 2012 (ENS) – Burning biodiesel produces compounds that can cause respiratory disease, researchers from Queensland University of Technology have found. The scientists say the discovery could lead to restrictions on the use of biodiesel as an alternative to petroleum diesel. The team looked at a range of biodiesels made from soy, canola and tallow, a rendered form of beef or mutton fat. They analyzed particle emissions from a single compression ignition engine operated at one test mode with three biodiesel fuels made from the three different feedstocks – soy, tallow, and canola. They tested four different blend percentages – 20, 40, 60 and 80 percent biodiesel. Using specialized analytical monitoring equipment developed at Queensland University of Technology, they discovered that burning diesel fuels with a high percentage of biodiesel produced higher emissions of compounds linked to respiratory disease. These biologically active compounds are called “reactive oxygen species” and form on the surface of small soot particles in the exhaust emissions, Surawski explained. Reactive oxygen species can lead to the type of cell damage called oxidative stress which, over long periods of time, can progress to serious respiratory disease. The team is now looking at ways of cleaning up biofuel exhausts. Led by Professor Zoran Ristovski, the research team is now focusing on understanding the way reactive oxygen species in the emissions are generated, and on how to remove them. Biodiesel can be used as a fuel for vehicles in its pure form, but it is usually used as a blend to reduce levels of particulates, carbon monoxide, and hydrocarbons from diesel-powered vehicles. Key consumers of biodiesel include urban and public transport fleets, harbor and marine operators in ecologically sensitive locations, underground mines, power stations, and users of machinery or vehicles in confined or closed areas. An increasing number of Australian mining and transport companies are trying B20 to B100 blends of biodiesel and petroleum diesel because of the greenhouse reduction benefits. 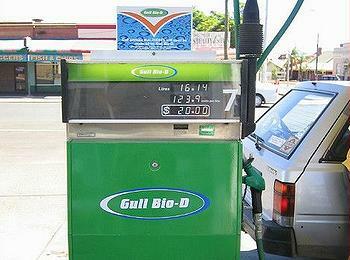 Biodiesel blends are available at an increasing number of service stations in all Australian states. The Queensland University of Technology scientists say their work is aimed at providing the transport industry with fuels that not only have a favorable environmental impact, but also place a lower burden on respiratory health.